Peel the mangoes. If they are very green, cut them down the centre and remove the small, inner seed husk, the immature outer seed will be soft and useable. If the mangoes are semi ripe, slice from the outer cheek until you strike the seed. Par slivers of fruit from the seed where possible. Two to three good medium sized mangoes should yield 550 g of flesh. 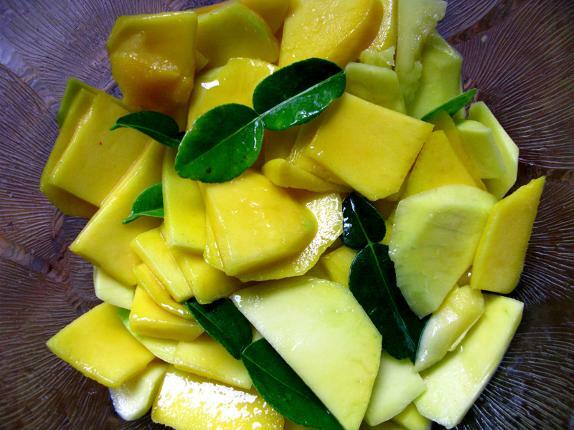 Place the mangoes, salt and lime leaves in a bowl and mix well, gently rubbing the salt into the flesh. Pack the fruit into a one litre (quart) jar, top with water and seal loosely. Every day, gently stir or seal the jar and invert several times. After one week, they will be ready to eat. 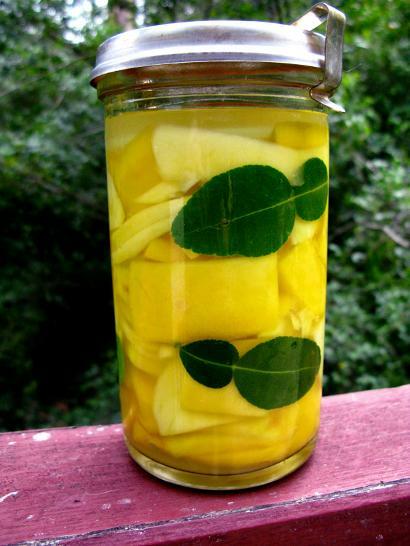 For longer storage, separate the fruit from the brine and leaves. Top up the brine a little, and boil it and the leaves, removing any scum from the surface. When the brine has cooled, strain out the leaves. Place the fruit in a sterilised jar, top with the cooled brine, then seal the jar. Store in a cool place.